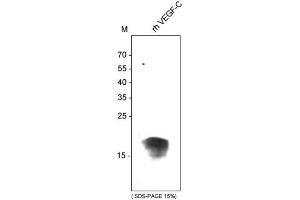 Western Blot: VEGF-C Antibody (107/F10) [NBP1-18626] - Analysis of recombinant human VEGF-C derived from insect cells using a monoclonal antibody directed against recombinant human/rat VEGF-C.
Immunogen This antibody detects human and rat VEGF-C in Western blots. No cross-reactivity is shown with VEGF-A. Specificity This antibody detects human and rat VEGF-C in Western blots. No cross-reactivity is shown with VEGF-A. Reconstitution Centrifuge prior to opening. Reconstitute with sterilized water to a final concentration of 0.1 - 1.0 mg/mL. Storage Comment Store at -80°C in the dark. Avoid freeze-thaw cycles. Product cited in: Podemska-Jedrzejczak, Malinska, Sujka-Kordowska, Nowicki, Puslecki, Jemielity, Perek: "Vascular restenosis in coronary artery bypass grafting might be associated with VEGF-C/VEGFR-3 signaling pathway." in: Heart and vessels, Vol. 33, Issue 9, pp. 1106-1120, 2018 (PubMed).